Designed by the world renowned designer, I.M. Pei. The Gateway with its stunning crystalline 37-storey twin towers, has become a prominent landmark in Singapore. 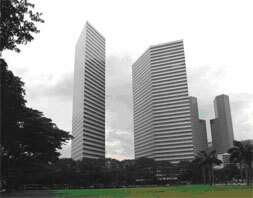 The twin 40-storey towers are striking in their appearance and geometry. Offering the observer varying views, both internally and externally, the acute external angles contribute to a precision in the appearance of the facade. In a recent retro-fit exercise, Monoflo is proud to be the preferred equipment, replacing the existing pumps, to serve the central air-conditioning system of this architecture marvel. In total, Asiatic supplied twelve units of Kompact Series horizontal split cases. Due to the high system pressure, the HSC pumps supplied were of ductile cast iron casings construction, with maximum pressure rating of 24bar.